Ten days ago I was in the midst of a 48-hour design blitz, held at the University of Illinois, Urbana-Champaign, with 30-some sophomore and junior design students, two of their professors (Brian Wiley and Eric Benson), and the two members of the Little Things Labs team who hadn't yet come down with the flu. I was there at the request of Megan Deal, who is a designer at the innovation laboratory Little Things Labs. Megan and I met during a Project M session in early 2009 and quickly became friends. We then worked together until mid-2010 on PieLab and related projects in rural Alabama. Until the workshop in Champaign, I hadn't seen Megan in over a year. It was great to catch up and learn about the work she is doing at Little Things Labs. They describe themselves as "a problem-solving laboratory that identifies and acts on pressing problems and emerging opportunities in mid-sized and post-industrial cities." To make it happen, they partner with foundations, corporations and non-profits, and then "discover, design and rapidly prototype tools that redefine community challenges as transformative opportunities." It's nothing short of inspiring, and I was happy to Amtrak & Megabus it down from Chicago to meet her co-workers and collaborate with them as an advisor for the weekend's activities. Brian worked to select a local non-profit, Prosperity Gardens, as the community partner and focus for the weekend's projects. Little Things Labs planned and facilitated the schedule, which began Friday afternoon with an obligatory icebreaker activity, followed by immersion — an on site visit and conversation with the community partner. The students documented the visit and took notes, preparing to share observations with the group later that day. The rest of the afternoon was spent assessing the challenges that we could work on, brainstorming possible solutions and opportunities, and then categorizing and delegating tasks to 5 unique teams: collateral, PR, funding, signage, and transportation. Each team of 5 or so students then worked into the night, trying to come up with unique and creative approaches to address these issues. The students did a great job and I had a lot of fun working with them. They worked late into Saturday night and then presented their ideas to the client the next afternoon. Nicole of Prosperity Gardens was blown away by the amount of work that was completed in such a short time. The class plans to continue working with the nonprofit on implementing some of the proposed concepts over the next few weeks/months. Even though they had to be in studio, working on Valentine's Day weekend (! ), I really think the students enjoyed themselves and were delighted to see all they had accomplished in 48 hours. Also, despite the flu, which eventually hit Megan on Sunday morning, the workshop went remarkably well and ran smoothly. And I learned something as well. Even though it was just a taste of it, I determined that I really enjoy teaching. So, thank you Megan, Brian, Eric, all of the students, and the rest of Little Things Labs. Hope we can work together again soon! make it go viral. 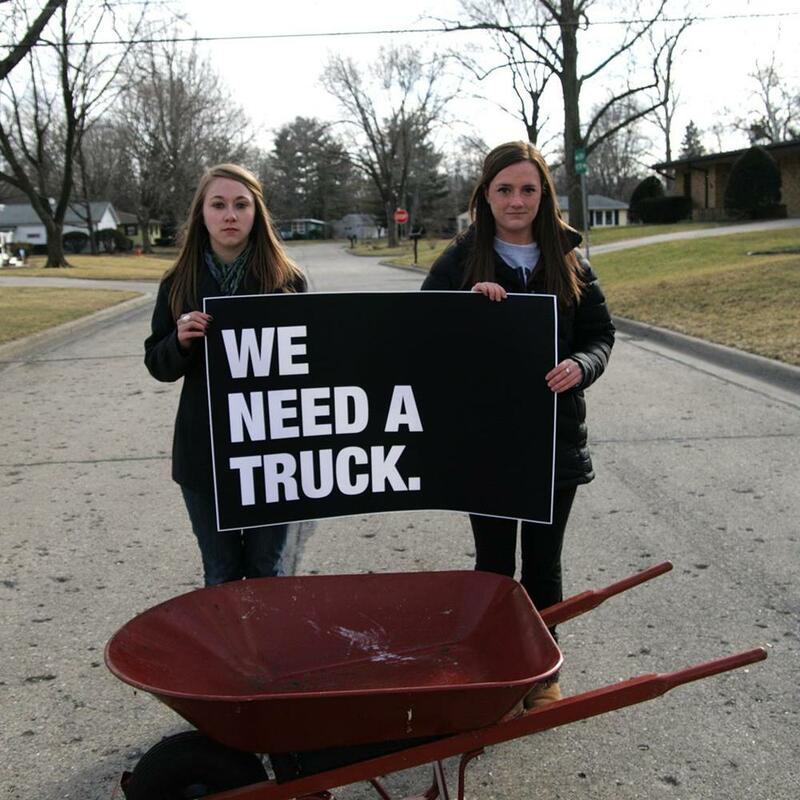 WE NEED A TRUCK!